Last summer while riding my local trails, I ran into another singlespeeder. We rode together and started talking about bikepacking and his friend that makes bikepacking bags. Ain’t mountain biking great? 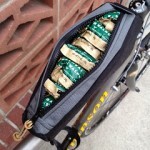 The friend he mentioned was Joe Tonsager who makes J.Paks bikepacking bags. After looking over Joe’s website, I could tell that the bags are very well made. Even better was the fact that he lives 25 miles away in Denver. You know how much I like local companies and you can’t get much more local than that. At the time, my bikepacking setup already had a quality handlebar system and a frame bag. J.Paks was not offering seat bags yet so I went with the SnakCan for my bag choice. The SnakCan fits on the top tube and attaches to either the stem or the seat post. 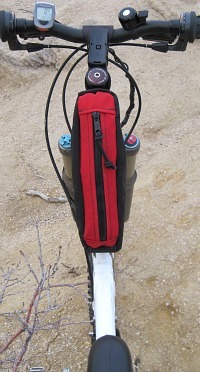 Bags attached to the stem work well for carrying items that you access frequently and quick snacks. J.Paks offers the SnakCan and a larger version named the SnakPak. Both run $40 which may seem pricey, but you are getting a handmade and extremely well built bag that can be customized to fit your bike setup. The SnakCan measures 9″ long, 2″ wide, and 4″ high at the tallest point where it attaches to the stem. The sides are semi-rigid to help it maintain shape and the beefy zipper makes it easy to open even when wearing gloves. Another nice feature is the single piece construction which reduces the number of seams and results in a stronger construction. Mounting the SnakCan is very easy. It comes with a wide heavy duty velcro strap that goes around the top tube and another velcro strap that goes around the stem. 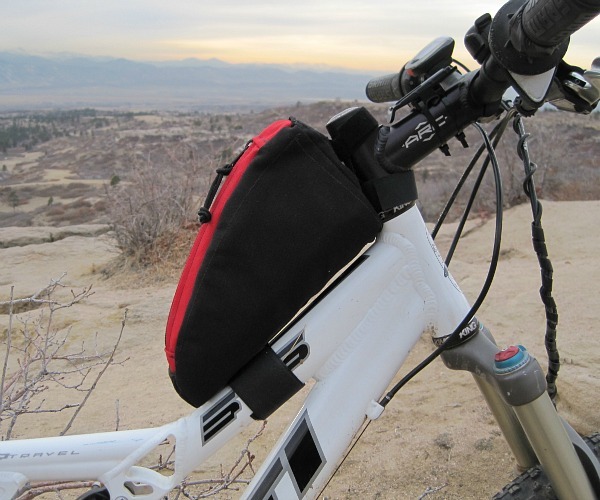 The front of the bag has two webbing loops that allow you to place the front strap either high or low depending on your stem and frame design. As you can see in the picture above, I actually used a strap in each loop. The two webbing loops may not seem like much, but these are the extra touches you get from quality handmade gear. That’s a whole lotta items for a small top tube bag. Before purchasing the SnakCan, I was using a stem bag from Eleven81. It was about the same size and worked well enough. But the Elevel81 bag did not mount as easily and was not nearly as well made – both fabric and stitching. Again, this is where a handmade bag pays for itself. The Eleven81 bag is now collecting dust in the garage and I’m enjoying the SnakCan for all of my rides. It stays mounted even for local trail rides because I don’t even notice it’s there and it doesn’t interfere with my pedaling. Joe takes great care and pride in making his bags. He is busy with a day job, J.Paks sewing, and lots of riding, but still works with customers to make sure they get the bag they want. For my bag, we discussed options for the velcro straps, but in the end his design worked perfectly without changes. The SnakCan has worked so well that I’m ordering one of the new SeatPaks that Joe has started to make this year.